I love glitter but sometimes it just feels too much for every day. Crackle glitters seem like the perfect alternative for a more subtle look. Let's see if they live up to that! I had no issue whatsoever with formula and one relatively thin coat delivered enough glitter for an even coverage. I used topcoat as they tend to dry matte but once TC applied, they were super sparkly. But, as much as I liked them over black, this is not the way I'd wear them. Have you noticed how they match shades from the China Glaze Tronica collection? Unfortunately, the crakling doesn't show up that much on camera but in real life, it's gorgeous : subtle sparkle that I'd have no issue wearing at work. I ended up loving this collection much more than I thought I would and I absolutely love it when this happens! 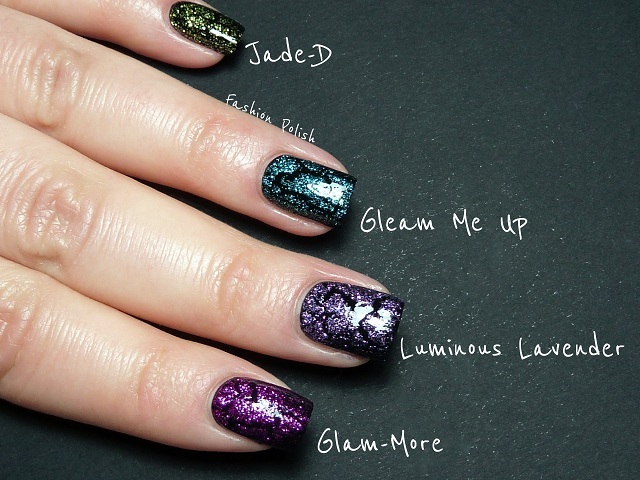 TheChina Glaze® Crackle Glitterscollection is already available as open stock colors and four-piece counterdisplay. Individual polishes retail for $9 MSRP and will be available atfine salons and beauty supply stores nationwide in May 2012. ChinaGlaze is a division of American International Industries. Wow, the Jade and the Lavender are simply GORGEOUS! I would never think of layering crackled over the same non-cracked color, but now I am sure I will give it a try! Very beautiful! Lovely glitter crackles <3 Your nails look gorgeous. 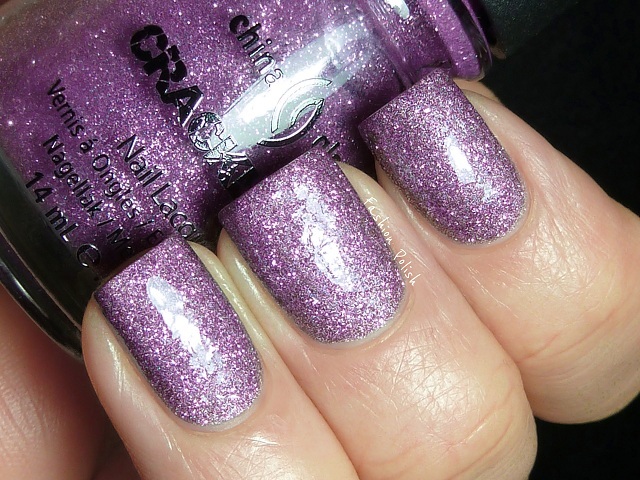 I have been long over the crackle trend but I am seriously reconsidering after seeing them over black! Kinda on the pricey side though..
Wow, I really didn't think these would be this great, but OMG! I'm not a crackle fan, but those actually do look really neat over black. Love how you showed this over the corresponding Tronica shade! I am like many - was over the entire shatter/crackle soon as it began...I called it 'way to wreck a great mani.' I saw 2 in the past I sort of liked. One was an Aqua metallic from CG - the other is the OPI one from the Nicki Minaj collection. I did not buy either of them - but just might still - there are 2 of this collection that I think I like enough to buy as well...the green is fab - saw it over Zoya Tallulah and it looks super. Then I like the Luminous Lavender.